That is my portrait of Ferran, one of the kindest people I have known. Ferran and I were both visiting Stefan Langerman, renting Brussels apartments one above the other with our wives. We'd work all day, eat at a different but always superb restaurant (one always ate well in Ferran's presence), and then perhaps attend an evening concert. 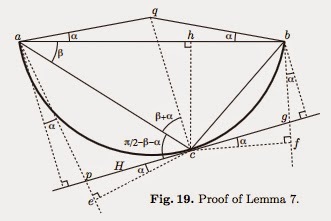 Work on one paper ("Highway Hull Revisited") was nearly complete, but we had only a convoluted proof of Lemma 7. I wanted to close out the paper; Ferran frowned morning after morning with displeasure at our proof. Then one morning he arrived with a beautifully intricate elementary Euclidean geometry proof, ensconced in the above figure. He strove for simplicity and beauty in all his work, and regularly matched his own high standards. This is not only true in his geometry work, but also in his painting, his music, and even his dominoes play. I like to believe that he is now enjoying browsing proofs from The Book, and pleased to learn that so many bear his name.